Continuing with the RAD-seq library prep. Following the Meyer Lab 2bRAD protocol. After determining the minimum number of PCR cycles to run to generate a visible, 166bp band on a gel yesterday, ran a full library “prep scale” PCR. 5μL of ILL-BC# (1μM) – The barcode number and the respective sample are listed below. After cycling, added 16μL of 6x loading dye to each sample. Loaded 10μL of ladder on each of the two gels. Things looked fine. Excised the bands from each sample indicated by the green arrow. Before and after gel images show regions excised. Will purify the bands and quantify library yields. Prior to generating full-blown libraries, we needed to run a “test-scale” PCR to identify the minimum number of cycles needed to produce the intended product size (166bp). I ran PCR reactions on a subset (Sample #: 2, 3, 17, & 30) of the 10 samples that I performed adaptor ligations on 20151029. PCR reactions were set up on ice in 0.5mL PCR tubes. Combined 12μL of master mix with 8μL of the ligation reaction from earlier today. We’re following the “1/4 reduced representation” aspect of the protocol. As such, 5μL of each reaction was pulled immediately after the extension (72C – machine was paused) of cycles 12, 17, 22, & 27 in order to determine the ideal number of cycles to use. 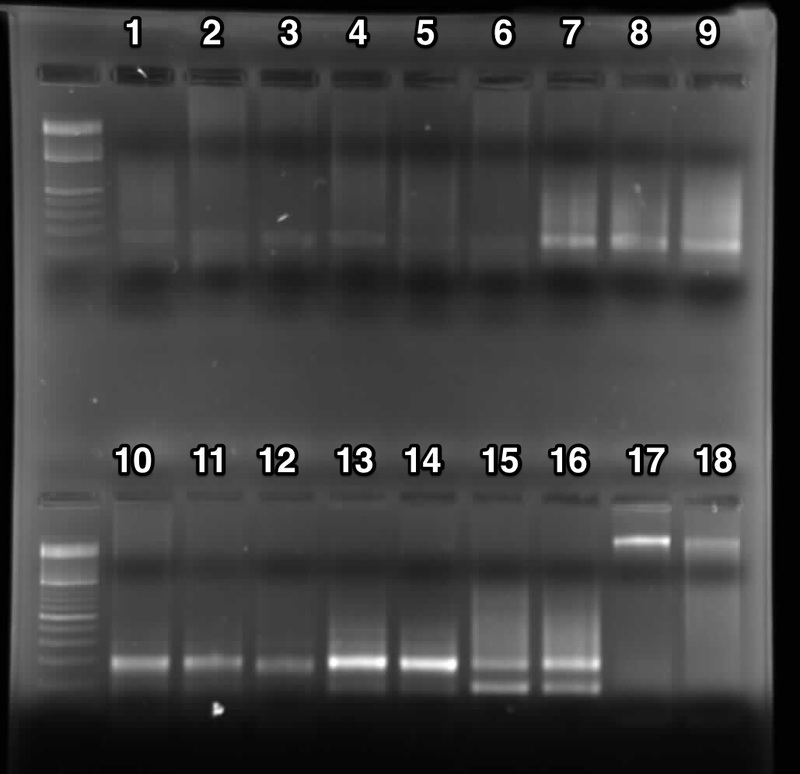 Also ran the ligation reactions (labeled “Ligations” on the gel below) of the samples as a pre-PCR comparison. Treated them the same as the PCR reactions: mixed 8μL of the ligation with 12μL of H2O, used 5μL of that mix to load on gel. These samples were run on a 1x modified TAE 1.2% agarose gel (w/EtBr). 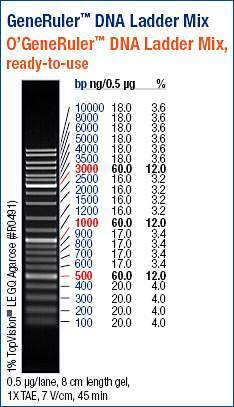 Gel image denoting sample numbers within each cycle number. Green arrow indicates the expected migration of our target band size of 166bp. Looks like cycle 17 is the minimum cycle number with which we begin to see a consistent ~166bp band. Will continue on with the “prep-scale” PCR using 17 cycles. NOTE: Samples 02, 03, & 04 did not have 40μL of the ligation reaction left (only 32μL) due to additional usage in the test scale PCR yesterday. Supplemented those three reactions with 8μL of H2O to bring them to 100μL. Due to limitations in available comb sizes and inability to combine combs to make larger well sizes, only loaded 58μL of samples in each well on this gel. Will load remainder on a second gel and combine after PCR products are purified. 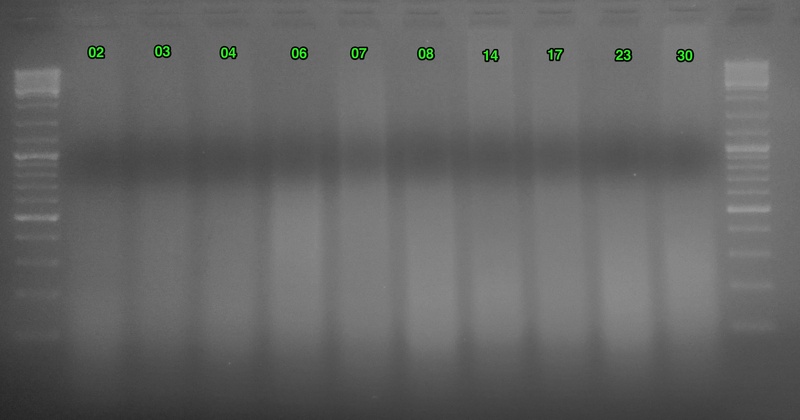 I ran PCR reactions on a subset (Sample #: 2, 3, & 4) of the 10 samples that I performed adaptor ligations on Friday. These samples were run on a 1x modified TAE 2% agarose gel (w/EtBr). 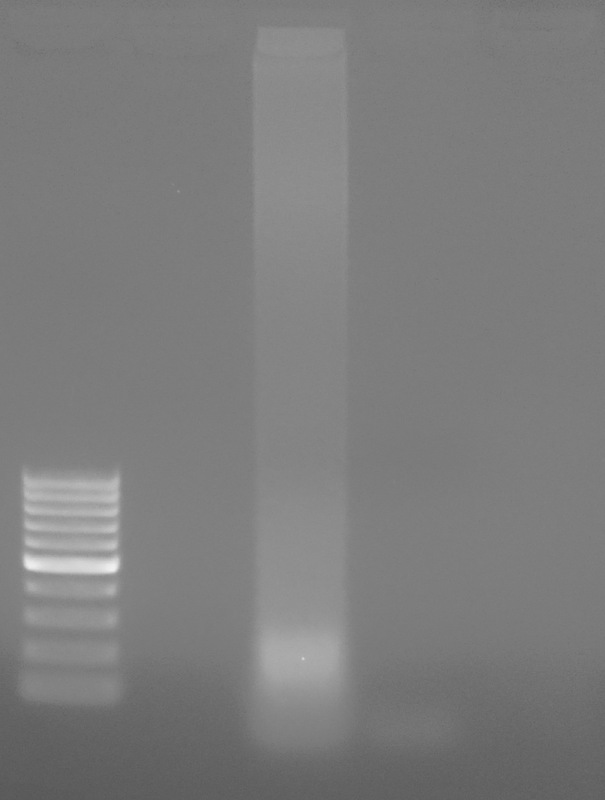 Test-scale PCR gel. Green arrow indicates desired band. The numbers below the headings indicate the sample number. This looks pretty good. The green arrow on the gel indicates the desired band size (~166bp). Although difficult to see on this gel image, there is a gradient in band intensities across the cycles (band intensity increases as cycle number increases). Looks like we can use 12 cycles for our PCRs. One other aspect of this gel that is very interesting is the ligations. The three ligation samples all show an intact high molecular weight band! This is very surprising, since the input gDNA from these three samples does not look this. Yesterday’s test scale PCR failed to produce any bands in any samples (expected size of ~166bp). This is not particularly surprising, due to the level of degradation in these samples. As such, repeated the test scale PCR, but increased the number of cycles. Following the Meyer Lab 2bRAD protocol. I ran PCR reactions on a the same subset of samples as yesterday (Sample #: 4, 7, 14, & 30). Combined 12μL of master mix with 8μL of the ligation reaction from yesterday. We’re following the “1/4 reduced representation” aspect of the protocol. As such, 5μL of each reaction was pulled immediately after the extension (72C – machine was paused) of cycles 27, 32, 37, & 42 in order to determine the ideal number of cycles to use. Also ran the ligation reactions (labelled “ligations” on the gel below) of two samples (samples #: 14 & 30) as a pre-PCR comparison. NOTE: Today’s gel image was taken with a proper gel imager (yesterday’s gel image was captured with my phone). The 27 cycles appears similar to yesterday’s results, even though the bands are not visible on yesterdays’ gel, due to limitations of the phone’s camera sensitivity. There are a number of bands visible on this gel. The green arrow on the image identifies what I believe to be the proper size band (~160bp). This band is present in all four cycling groups and at similar intensities across cycling groups. The two lower molecular weight bands are very likely primer dimers. The Meyer Lab Protocol indicates that primer dimers will likely be present at ~70bp, ~90bp, & ~133bp. Katherine’s test scale PCR. Notice how much more prominent her bands are in all cycle groups, compared to my gel above. Since this is my first foray into RAD-seq QC, I’m not certain whether or not our test scale PCRs indicate any level of success. I will consult with Katherine and Steven about what they think. Since we’re on a timeline, and we’re just testing the viability of this whole process, I suspect Steven will have me proceed and see how things turnout. Prior to generating full-blown libraries, we need to run a “test-scale” PCR to identify the minimum number of cycles needed to produce the intended product size (166bp). I ran PCR reactions on a subset (Sample #: 4, 7, 14, & 30) of the 10 samples that I performed adaptor ligations on earlier today. All components were stored on ice. We’re following the “1/4 reduced representation” aspect of the protocol. As such, 5μL of each reaction was pulled immediately after the extension (72C – machine was paused) of cycles 12, 17, 22, & 27 in order to determine the ideal number of cycles to use. 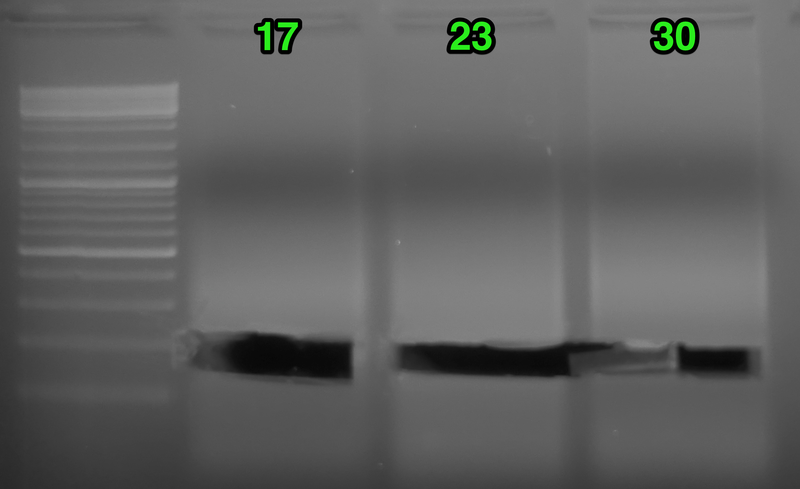 Also ran the ligation reactions (labelled “Digests” on the gel below) of two samples (samples #: 4 & 7) as a pre-PCR comparison. The results aren’t great. No band(s) visible in any samples at even the highest cycle number (27 cycles). Although, if you squint pretty hard, an extremely faint band might be visible in between the 100/200bp markers in the 27 cycles group. Regardless, the PCRs will need to be repeated with an increased number of cycles. This is not terribly surprising, as the Meyer Lab protocol indicates that degraded samples will likely need a greater number of cycles than what they recommend and that cycle number will have to be determined empirically. Ran a PCR to obtain luciferase DNA for sequencing. Used sea pen gDNA extracted by Jonathan on 20150527. Ran samples on 0.8% agarose, low TAE gel stained with EtBr. PCR did not work. Was expecting a band of ~800bp. Looks like I may have overloaded the PCR reaction with gDNA. Used 10μL of gDNA. However, that is quite the smear, suggesting a significant amount of degradation present in the gDNA. Will re-run this PCR next week with less gDNA (or, cDNA instead) in order to generate a PCR product. Submitted a plate of purified PCR products (PCR products prepared by Jake on 20150623) that Jake set up yesterday, to the UW High-Throughput Genomics Center for Sanger sequencing. 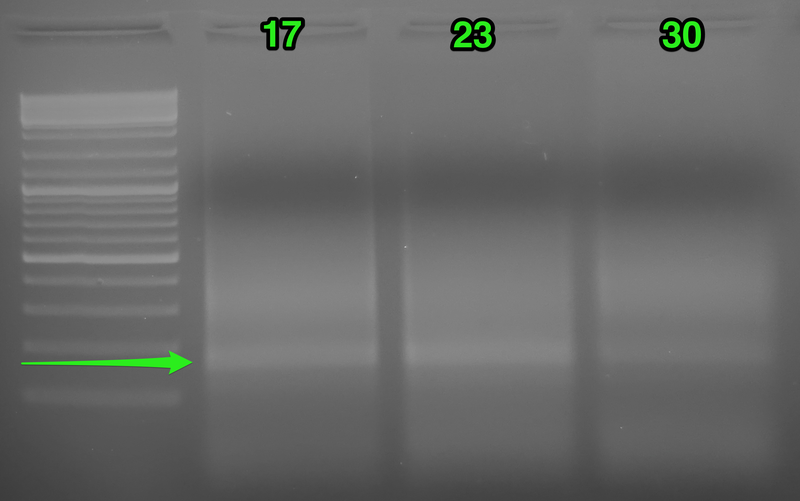 Purified DNA from the remaining PCR bands excised by Jake on 20150609 and 20150610, as well as Jonathan’s sea pen PCRs from 20150604, using Ultrafree-DA spin columns (Millipore). Transferred gel pieces from storage tubes (1.5mL snap cap tubes) to spin columns. Spun 10,000g, 5mins @ RT. Transferred purified DNA back to original storage tubes. See the sequence_log (Google Sheet) for a full list of the samples and the sequencing plates layouts. Purified DNA was stored @ 4C O/N. Will prepare and submit plates for Sanger sequencing tomorrow. Submitted a plate of purified PCR products (PCR products prepared by Jake on 20150609 and 20150610) that Jake set up yesterday, to the UW High-Throughput Genomics Center for Sanger sequencing.